Today.Az - Maros Sefcovic: TANAP’s official opening - "we are turning intentions into reality"
Maros Sefcovic: TANAP’s official opening - "we are turning intentions into reality"
The official opening of the Trans Anatolian Natural Gas Pipeline (TANAP), which is a part of the Southern Gas Corridor that envisages transportation of Azerbaijani gas to Europe, is a key milestone, European Commission Vice-President for Energy Union Maros Sefcovic told Trend June 12. “The Trans-Anatolian Pipeline, together with the South Caucasus Pipeline and the Trans-Adriatic Pipeline, is an essential part of the Southern Gas Corridor. Its official opening therefore marks a key milestone, as Caspian gas can now flow to Turkey on a commercial basis,” said the European Commission’s vice-president. “By helping diversify our energy suppliers and routes, the Southern Gas Corridor is strategically important for the EU's energy security. We all stand to gain from this 'bridge' between the Caspian region and the EU market. 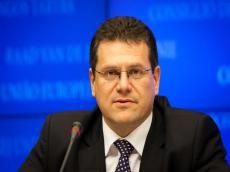 It is in our joint interest to make it a success,” said Sefcovic. The ceremony of launch of TANAP is due to take place on June 12 in Turkish Eskisehir city.